« World of LordCraft – Don’t Play, My Lord. 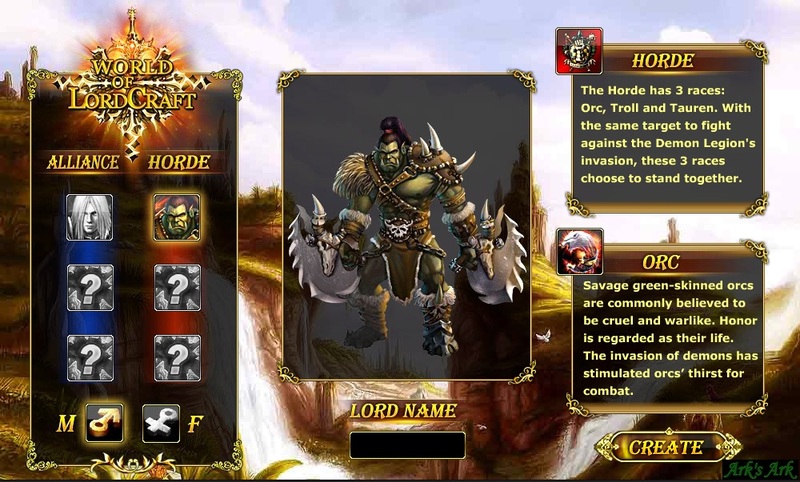 World of Lordcraft Character Creation Screen. Sadly, Tauren appear to be a race you have to unlock somehow, so I go with a boring old Alliance human. You’re then offered the chance to start in such interesting sounding locations as the Barrens, Stranglethorn Vale, or the Swamp of Sorrows. Players have been discussing about the source of World of Lordcraft recently. We consider that a statement should be made here to clarify the issue. World of Lordcraft should be regarded as a fan game of WoW. All the creators and staff members of this game love WoW and we thank Blizzard for such a brilliant work. WoL is not a replica of WOW. WoW is a MMORPG while World of Lordcraft is only a browser game of building, strategy and simulation. They are totally not the same kind. All the artworks in World of Lordcraft are the original creations of our art team. However, some elements were similar to WoW and some other games. Likewise, WoW also borrowed some elements from Tolkien’s novel. We hope that WoL can provide an interesting alternative for those players lacking time for WoW raids and arenas. Or you may also insert a few clicks between raids or wipes in WoW. We’d appreciate your support if you like World of Lordcraft and wish you have fun in the game. Well, that all sounds quite reasonable (To me. Not to Blizzard’s legal department), if it really was just a fan-based game, with no intent to make profit. However, it appears to be a rather professional operation, and is funded in exactly the same way as Evony, through buying ingame currency. All rights and title in and to the Service (including without limitation any user accounts, titles, computer code, themes, objects, characters, character names, stories, dialogue, catch phrases, locations, concepts, artwork, animations, sounds, musical compositions, audio-visual effects, methods of operation, moral rights, any related documentation, “applets” incorporated into the Game Client, transcripts of the chat rooms, character profile information, recordings of games played using the Game Client, and the Game Client and server software) are owned by Thunderstorm Entertainment Inc. or its licensors. The Game and the Service are protected by United States and international laws, and may contain certain licensed materials in which Thunderstorm Entertainment Inc.’s licensors may enforce their rights in the event of any violation of this Agreement. I don’t think Blizzard’s lawyers are going to like that terribly much. Who are Thunderstorm Entertainment anyway? The only Thunderstorm Entertainment I can find on Google is an Los Angeles based small film company specialising in recording weddings. Wait a moment. Thunderstorms and Blizzards are both weather events. It was then I realised that the terms and conditions for World of Lordcraft were extremely extensive. Far too extensive for a simple browser game. World of Lordcraft’s Terms and Conditions. World of Warcraft’s Terms and Conditions. Yes. World of Lordcraft is so impossibly unoriginal that they have stolen WoW’s Terms and just done a search/replace for every mention of Blizzard to change it to Thunderstorm. I haven’t yet plucked up the courage to give LordCraft a playthrough. I’ll let you know if I do. Just watching this trailer drained enough of my will to live that I think I’ll put off actually playing it to another day. The narrator sounds like he has been drugged and locked in the bathroom. Either that, or he is doing a particularly poor Sean Connery impersonation. “Never Surrender You Freedom!” I want to build an UNPRECEDENTED Epic Castle! Why is it UNPRECEDENTED, you ask? Castles have been known to appear in both the real world, and in games, but perhaps they just weren’t as epic as LordCraft’s castles. Or maybe they build them out of all the cease and desist documents they receive in the mail. The person who made this trailer clearly has a decent amount of talent in animation. A tragic waste. The same might perhaps be said for World of LordCraft as a whole. It is not a terribly hard thing to create your own Tolkienesque fantasy world. I could probably knock three of them up between breakfast and lunch. An ounce of creativity (or failing that, a random fantasy name generator) would have let them avoid the incoming legal storm. Update: I charge World of LordCraft with being another of the heads of the Evony hydra. As evidence I present the welcome screens to both games. You can click the images to enlarge them to read the text. Apparently they’re both “The World’s Best Web Game”. Which is lying? My money would be on both of them. So many aspects of the design are identical that I’m fairly confident that David Guo’s UMGE, the company behind Evony, is also behind World of LordCraft. This is not the first MMO that the Evony gang have committed grave crimes against, as Maltheas reported. The same advice I gave that you do not give Evony your credit card details applies equally to World of LordCraft. It is just not worth the risk, as they obviously have a problem distinguishing between things that belong to them, and things that do not. Even more importantly, if you must play, absolutely do not use the same password you use for WoW, unless you want to end up assisting UMGE’s goldselling division. Update: I’ve posted some more about LordCraft’s obvious ties to Evony, and the source of the buxom lass for one of their recent adverts. They had also changed the address of the Lordcraft Terms and conditions. Changed the web address, but not the fact that it’s a direct copy of WoW’s terms. The link has been updated. I’ve updated with a picture from character creation that demonstrates quite how closely they’re following the World of Warcraft IP. I think world of lordcraft is a pun on evony. OR its a second evony, because the other one is hated so much. But that would be weird because they use the same advertising tech. It seems the creators are flying away with the money of players. The website no more exist and Thunderstorm is a “dummy company”. All players who gave money by Paypal have to do reclamation quickly ! They’ve been shut down by legal action from Blizzard. Their link redirects to Blizzard now. Thanks for the headsup! Done a little follow-up post! Ein toller Fellsattel zeichnet sich in erster Linie insofern aus, dass der Fellsattel genauso gut für den Gaul und für den Reitenden sein kann. Das sollte vorrangig der entscheidende Punkt bei dem Kauf eines Fellsattels sein. Jetzt könnte man ins Detail einsteigen und detaillierte Kriterien der unterschiedlichen Varianten beachten. Logischerweise spielt auch hier das Alter die nicht unwichtige Rolle. Für die Kleinen eignen sich vor allem rutschfeste Fellsattel. Bei Ausgewachsenen darf dieser Punkt nahezu missachtet werden. Gleich maßgeblich ist selbstverständlich der Komfort des Sattels. Hier bietet sich besonders ein Fell aus Lamm an. Der Stoff oder das Fell ist sehr angenehm und ebenfalls schonend zum Pferd. Ein Fellsattel aus Lammfell ist wahrscheinlich die beste Lösung die ein Pferdeliebhaber haben könnte. Zwar ist dieser Fellsattel ebenfalls im Preis enorm höher als andere. Hello,I read your blogs named “World of LordCraft – Evony decides to take on Blizzard « Ark’s Ark” on a regular basis.Your humoristic style is witty, keep doing what you’re doing! And you can look our website about proxy server list.